This observation covers part of a fan-shaped deposit of material in the Aeolis Mensae region of Mars. The dominant surface texture is a series of parallel linear ridges. In addition, there are several sinuous, flat-topped ridges. The sinuous ridges do not follow the trend of the linear ridges, and various intersecting relations are observed. 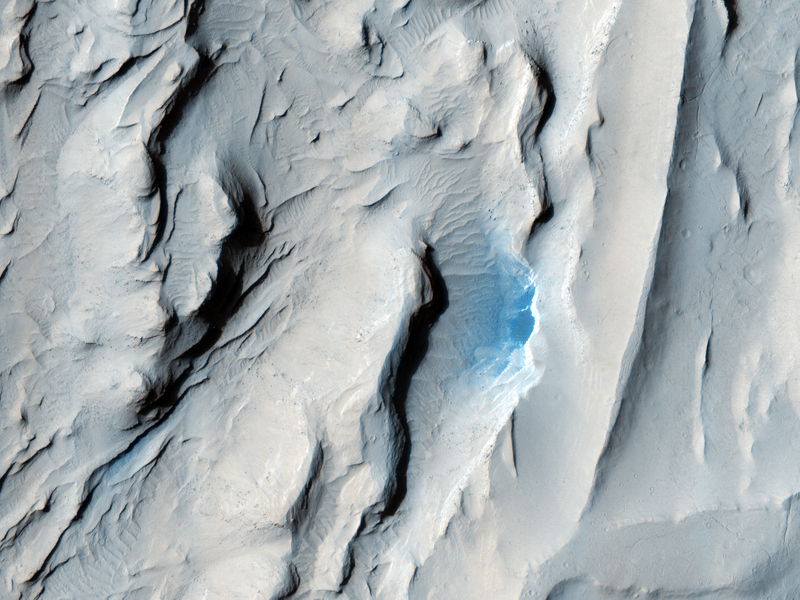 The southernmost sinuous features in this image are partially buried by linear ridge material, while in the northern part of the image they appear to stand above it. This could indicate that the linear unit has been more eroded in the north than the south, but may also be due to a more complex geological history in which different sinuous ridges formed at different times. In the northeast part of the image one sinuous ridge appears superposed on another, supporting this hypothesis. The linear ridges may be yardangs. Yardangs form when material is eroded by wind, producing elongated features aligned with the prevailing wind. Many of the ridges expose layers and appear to have broken into boulders. Layering indicates multiple episodes or pulses of deposition, while the occurrence of boulders shows that the material has been consolidated to some degree. The sinuous ridges could be former stream channels outcropping in inverted relief, where a formerly low-lying feature is now relatively high-standing. This occurs when the stream channel is more resistant to erosion that the surroundings, either due to cementation by water or to the presence of large rocks which are not easily eroded. In this case, the sinuous ridges contain few boulders resolvable by HiRISE, generally appearing uniform and smooth. They also contain fractures which in places cut across the entire ridge. Both of these observations are consistent with cementation of former channel floors. This is a stereo pair with PSP_002002_1735.